UAVs are increasingly complementing other sources of survey data and information in the construction and civil engineering industries. Information gathered via a UAV can assist the construction & engineering process right through from pre-planning to marketing a property or commercial site. 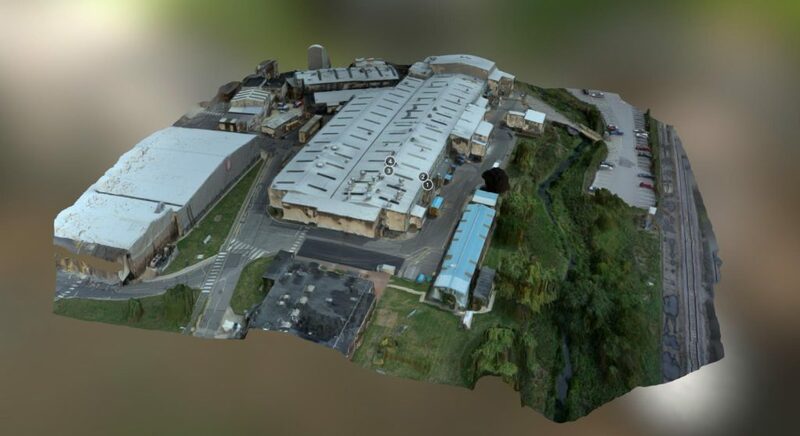 UAVs can form part of the Scan to BIM work flow by capturing the as-built environment. The resulting survey data, generally a point cloud, can be processed and imported into BIM software such as Autodesk Revit & Archicad to create an intelligent 3D model. UAVs can be utilised in the BIM work flow as they are ideal for scanning the externals of buildings due to their speed. This data can then be merged with laser scan data collected for the building internals to produce a complete point cloud of the whole building, inside and out. Unlike laser scanners, UAVs are able to scan inaccessible objects not visible from the ground such as roof tops meaning that a full and complete data set can now be achieved and due to their mobile nature UAV captured data suffers much less from shadowing from nearby objects. A scan from a UAV is the quickest and cheapest solution to produce a single shared 3D model which will be required by level 3 BIM. 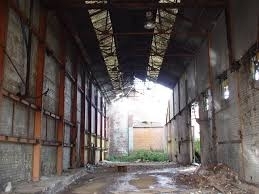 Our surveys are intended for both architectural and engineering use and can be provided in many formats e.g. data can be supplied in CAD format to the appropriate scale, as well as those for integration in the BIM process. Whether they are used for surveying, to show clients and potential clients an aerial overview of completed projects, to monitor jobsites to ensure safe practices or to inspect structures, UAVs are set to become a vital tool for the industry. The data they provide is as accurate and in some cases more accurate as that obtained via other sources and the use of UAVs has a range of additional benefits not least of which is cost. REQUEST A QUOTATION Call us on 01444 401840 to see how we can help your project. What data can a UAV gather in a single survey? What can this data be used for? Why use a UAV for your Construction requirements? 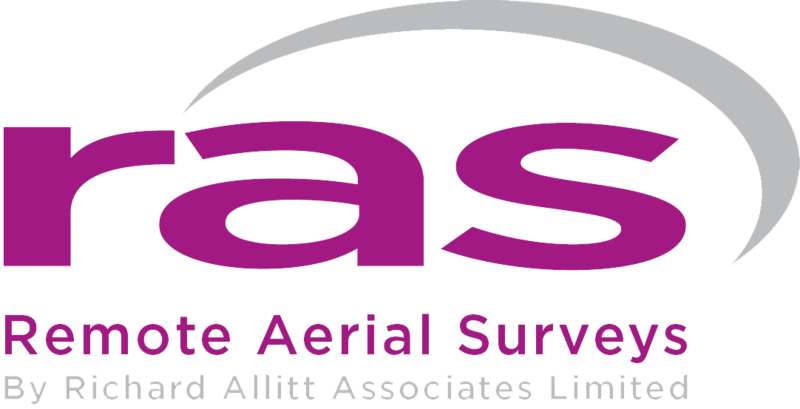 Remote Aerial Surveys not only has the imaging equipment required to carry out surveys but is highly skilled in GIS and remote sensing so that we can offer a full survey and mapping service as well as more straight forward photography and videos. Ground based survey techniques are well established within construction however UAV mounted tools are an excellent complementary source of information. There are a number of key advantages to using UAVs to gather data. Data from UAVs can be supplied in a variety of ways such as mesh, point & vector based formats. At the planning stage from the data gathered Remote Aerial Surveys can use photogrammetry to generate digital surface models as well as 3-D visualisations and photo realistic models. 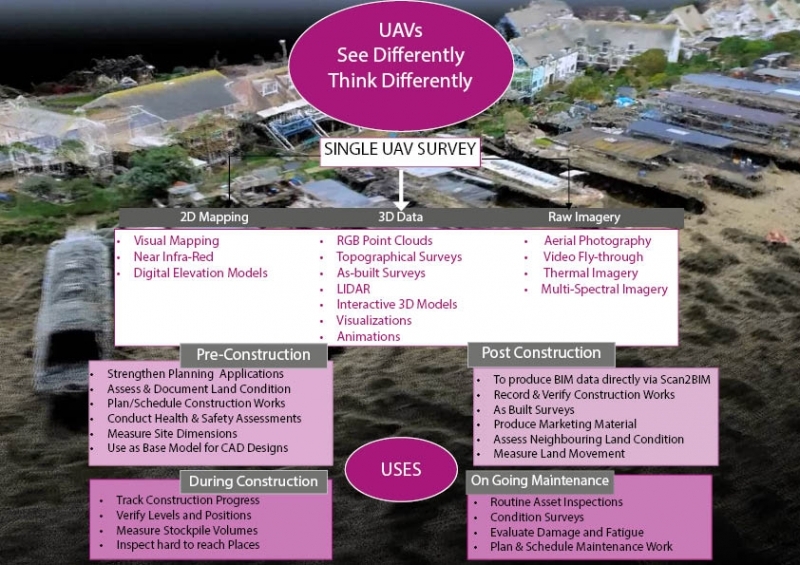 Whatever your survey requirements UAVs offer a new way of information gathering. From digital elevation models we can carry out volumetric analysis to aid construction planning to evaluate for example how much earth or vegetation needs removing from a site. We also have the skills to provide expert advice on surface water run-off, flood risk and other urban drainage related issues from survey data gathered via our UAVs. In addition to all the survey related information Remote Aerial Surveys can deliver exceptional high resolution imagery. With repeatable flight paths construction progress photography can be quickly and easily obtained at regular intervals throughout the project. Finally, our creative team is adept at taking unique and stunning images from the air, which give an added dimension to marketing and promoting new builds and commercial premises. So from site identification right through to sale our UAV team can add value to the process saving time and money and delivering a better result alround.